A Brutalist Bertrand Goldberg building is getting painted. Preservationists aren't happy. A crew began painting white over the exposed concrete walls of the building's ten-story atrium, which the architect envisioned as a sunlit interior street. "It's a shame," a Chicago architecture critic said. 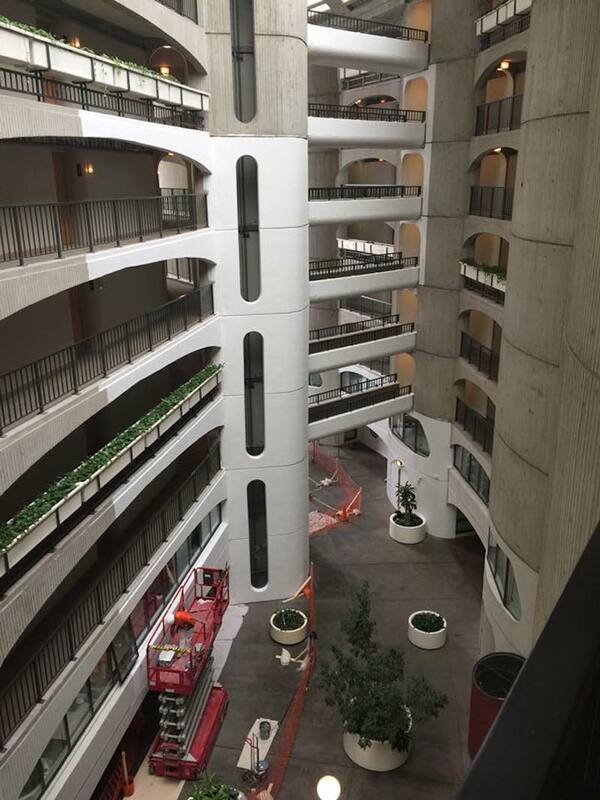 A firm that purchased the River City condo complex in bulk last month for conversion to rentals is starting a significant change to the building, designed by late modernist architect Bertrand Goldberg: a crew is painting the exposed concrete walls of the building's interior atrium white. Goldberg designed the building and others, including Marina City and the now-demolished Prentice Women's Hospital, in the style known as Brutalism. That name refers to breton brut, the French term for raw concrete, not to the perceived harshness of the designs. The exposed concrete walls of River City's curving, interior atrium have remained exposed concrete since the eccentric riverside structure was completed in 1986. When the joint venture of Marc Realty Capital, The Wolcott Group and Ruttenberg Gordon Investments completed its $90.5 million purchase of all 449 condos in December, the firm said in interviews that renovations would start in January. This morning, a painting crew began painting the ten-story atrium, which Goldberg likened to a "river road," white. "I think it's vandalism," said Robert Olsen, a River City resident who, with his husband, owned three River City units and opposed the bulk sale to Marc Realty Capital, a process that took almost two years to consummate. David Ruttenberg, the Marc executive who shepherded the firm's bulk purchase, did not immediately respond to a request for comment. A person answering the phones at the firm said Ruttenberg is the only one who can discuss the building. River City does not have landmark status that would prevent changes to the original design. Olsen said the common hallways, whose walls were not exposed concrete, were also being painted. "They needed it," he said. Painting Goldberg's "river road" "is a shame," said Lee Bey, a prolific writer and speaker on Chicago architecture and former architecture critic for the Chicago Sun-Times. "It really is a significant change to a space that Goldberg thought out very carefully," Bey said. "He brings this curvilinear 'street' inside the building, with the sun coming in from above. He thought of it as a street in Paris." The interior, Bey suggested, is crucial to Goldberg's design. While the architect's famous Marina City, the twin corncobs on the Chicago river downtown, "is largely expressed outward," Bey said, "for River City he brought that expression inward." Goldberg used concrete in part to provide texture, and "to paint all that over in white is unfortunate," Bey said. He said he understood "why a developer would want to do this: in real estate now, we want everything light and white."